This is a self-serviced apartment which will fit 4 guests comfortably. Guests will have access to everything seen in the pictures! New modern, open style kitchen, fully equipped. Everything you need for a private, comfortable, convenient and affordable stay (Wi-Fi, fully equipped kitchen, TV). Bogota is a big city and late check-ins cost us time and money to get there. There will be a small check-in fee (10 usd) after 8 pm (20:00) and on public holidays. 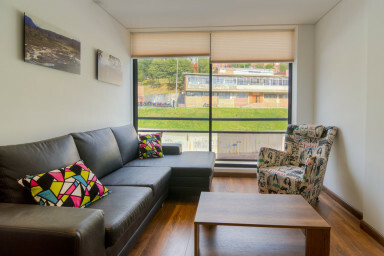 This quiet apartment is ideally located in Chapinero Alto, the trendiest "Soho" neighbourhood of Bogota! The apartment is located in Chapinero Alto (Carrera 3 y Calle 57), one of the most exclusive and exciting neighborhoods in Bogotá. It is a culturally diverse hot spot, close to nightlife, restaurants, and the best gastronomy area in the city, a definite favorite among visitors to Bogotá. 5 minute walk to Bogotá "Soho" area with restaurants, bars, french bakery, etc. 15 minute walk to Zona G the best gourmet area of Bogotá. Next to Circunvalar, amazing access to all city. Easy access to the North Zona Rosa and centro/Candelaria parts of Bogotá.